To set this up you need some objects, a flipmap and a lighted torch. The objects can be found in the Library wad and can be copied into your levelwad using WADMerger. 1/ Create two rooms and connect them with a horizontal door. 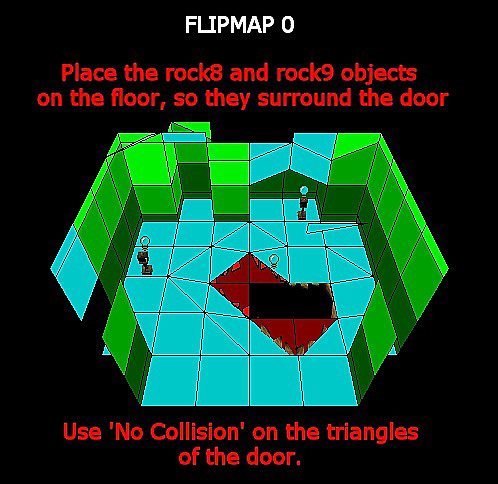 Raise some triangles around the door to create the shape of the burning-floor object. 2/ Use Toggle Opacity on the door to the lower room. So Lara can walk on the floor and the torch won't fall through. 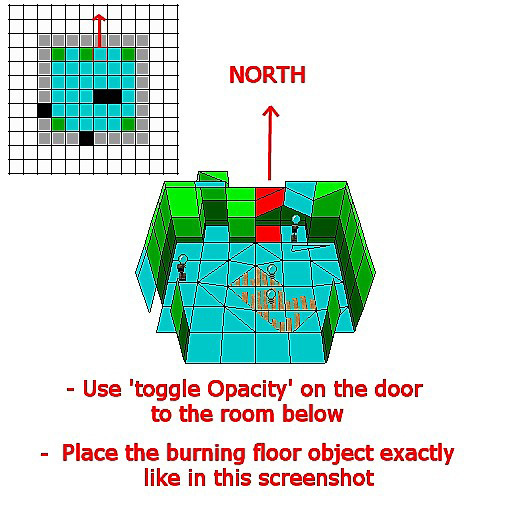 3/ Place the BURNING_FLOOR object on the door. Place it exactly as shown in the screenshot below. Why? Because the position of the flames appearing after you throw the torch onto the floor is hardcoded and they will always appear the same way: in the way the floor is placed in the screenshot. 4/Trigger the burning_floor in a place where you can't see it but that Lara will cross for sure. 5/ Now flip the upper room and make it Flipmap 0. No need to place a trigger for the flipmap. 7/ Don't use Toggle Opacity this time and apply No collision on the triangles of the door.